She was born on May 11, 1922 and was the daughter of the late Joseph and Mabel Salkled Goodgasell. 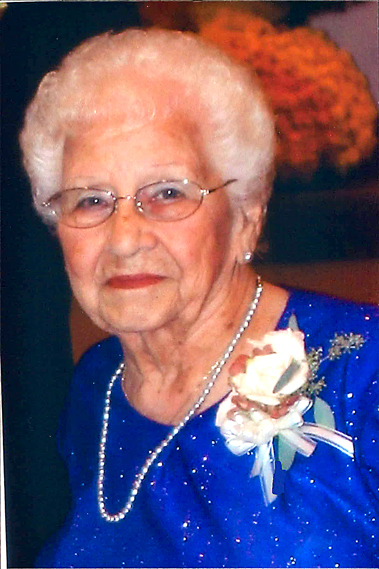 She was a member of Seven Sorrows of the Blessed Virgin Mary Catholic Church, Middletown; and was a homemaker and enjoyed knitting and sewing. She enjoyed the love she received from her family, especially her grandchildren. In addition to her parents, she was preceded in death by her husband George E., three brothers Charles, Eugene and William Goodgasell, and two sisters Agnes Gallo and Janet Goodgasell. She is survived by her two sons Edward T. Smerick of Middletown, and Michael C., husband of Barbara Ritter of Hummelstown; three grandchildren Edward J. Smerick and companion Katie Witmer and her children Conner and Amber Witmer of Middletown, LaTisha M., wife of Boe Kirchner of Lewisberry, and Adam, husband of Audrey Smerick of Manheim; two great-grandchildren Zander Kirchner and Marissa Smerick; sister Judith Goodgasell of Ford City; and brother Richard Goodgasell of Kittanning. Mass of Christian burial was held on Tuesday at her church, with the Rev. Ted Keating as celebrant. Burial was in Indiantown Gap National Cemetery, Annville. Memorial contributions may be made to the Make-A-Wish Foundation of America, 4742 N. 24th St., Suite 400, Phoenix, AZ 85016.